Race Review: The Performance Series Race #3 (City) [10km] (by Jillian) | JustRunLah! 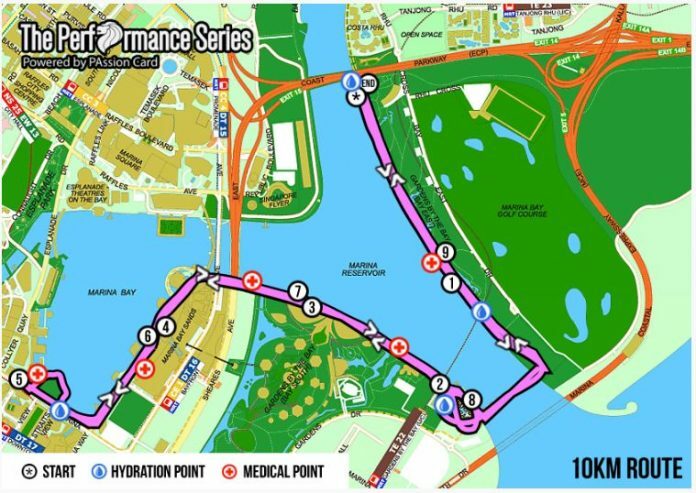 The 3rd race to The Performance Series starts off at Gardens by the Bay East. It is not as ‘famous’ as the one between Marina Barrage and Marina Bay Sands and hence I got a little lost on race day. Flag off for the race started at 8 am for wave 3 (10 km) and off we went jogging/running down the track towards a bridge that allows us to cross over the Singapore River to reach Marina Barrage. At Marina Barrage, we were then required to go up and then circle down towards Gardens where the flower domes are. Our journey continues on towards Marina Bay Sands and further down towards Marina Bay Link Mall before we make a U-turn back the way we came. The whole running experience was really great as the roads are fairly wide and there is no congestion along the race routes. I’m one of the many runners who ran with their Pokemon Go app open and a 10 km distance helped me hatch a couple of eggs. There’s a few good pokemons along the way like Jynx in Gardens (East) and plenty of Magikarps. But I’ve got to say, I’ve wasted a lot of pokeballs catching the Pokemons while trying not to affect my running pace. I ended up giving up on playing Pokemon Go and just focusing on the run HAHA. There were 4 hydration points along the way and all 4 were placed at strategic locations. The volunteers did a great job in helping to hand out the refreshments. There was no congestion at the end of the race where the runners queued for their medals. The medal looked beautiful as always. We were also given our finisher tee which has yellow wordings over a dark blue background and a bottle of Lucozade. I guess the weather was too hot till my bottle wasn’t even chilled. The drink would have tasted even more refreshing if it was colder! Running along the Singapore River has always been my favourite. So needless to say, I’ve enjoyed this race (as compared to the previous 2) the most! I love the scenery there! Click here for more post from Jillian.